Wow, I don’t think I’ve ever seen anyone compare free agency with the Reformation before. Good stuff. As for Halladay, I’m not sure how much leverage the Jays’ front office has in dealing him. Other teams know he’s going to be a free agent after next year and might prefer to wait. Few teams can afford to sign him to an extension, and he can veto any trade to a team that can’t afford him. I only mention this because the Twins faced a similar situation in dealing Santana, and ended up having to accept a lesser package from the Mets when the Yankees and Red Sox decided they would rather wait until he entered free agency. Doc should fetch half the farm in prospects, and if the Jays don’t get it, they should probably just hang onto him and take the draft picks. Ya, I can’t believe I did than too. I’m being serious, just having fun. It is a tough situation now with Halladay. He has given the Jays an offseason deadline to trade him because he doesn’t want to miss out on Spring Training with another team. The no-trade clause is big because it really narrows our chances of getting a deal done. Many people think it is now a race between the Yankees and Red Sox for the trade!! Now I hear the Red Sox are backing away from a deal that includes Clay Bucholtz and Casey Kelly???? Nice prospects yes, but do they know who they are dealing with here? It’s Roy Halladay! Have they not seen him every year come out and dominate them? Do they want to beat the Yankees next year? If I were them I’d step up with a big offer or prospects, take it and run! I don’t know why other teams are not willing to do the same? The man is an Ace, and a difference maker. Look what solidifing Sabathia in New York did for that staff last year? Too much talk! Not enough action. Just like last year, if they don’t step it up they are missing the boat … Let me tell ya! Gonzo’s defence may be better than Scutaro’s, but I’m going to miss that .379 OBP. Scutaro was one of the reasons Lind and Hill each drove in 100 RBI this past season, as the former’s leadoff abilites to get on base set the table for the 3-4 hitters in the lineup. I’m not sure Gonzo will do that trick, and who will hit leadoff in 2010 for the Blue Jays? The runs and the .OBP was amazing for Scutaro last year. He has always had a high .OBP, but not like last season. He really hasn’t done anything like that another time in his career. I fear that last season was just a ‘career year’ for Scutaro, and I’m skeptical that he will be able to follow that up. 2 years 12.5 million is a little less than I thought for him, but the Jays are still saving money with Gonzo at short. Maybe we could have got Scutaro back for that kind of money? We did get the #29th pick overall, and a suppelmental round pick out of it! I’m extatic about that! Antho is revamping scouting with the Jays. I want to see what kind of ‘crop’ the young GM can produce. As far as a leadoff hitter? We will see what the Jays outfield looks like next year? Wells, Snider and ????. I like the conversion of Adam Lind to 1B. The only other guy with some speed I can think of is Bautista, but I don’t know if we are keeping him either? Bautista’s .OBP was .359 last year. Decent. We can’t rule the two insurance SS the Jays aquired this offseason either, Hoffpauir and McCoy are both good .OBP guys and could possible work their way to the club?? In two years I’d say, the will also see the progess of Justin Jackson, a very young 2nd round pick struggling in the minors now? Also, I always thought with Overbay’s high .OBP that he should be batting 2nd and not Hill. Hill has proven a capable #3 in my opinion, being our most efficient hitter last year. But you know Cito’s stance on mixing with order. He doesn’t really do it at all. Roy, I hear ya on Halladay. The FO, like some of my compatriots, seems to be reluctant to trade away Buchholz, in particular (I recall that his name was connected to trade talks last year at the deadline). The FO also seems wary of signing longer-term deals, so it would be interesting to see what kind of years we’d offer, let alone $$ figures. (Contract length, more than $$, seems to stall negotiations with our FO, esp. with “Beam Me Up Scotty” and his clients). There is also some question about how many innings he has logged, and whether he’d hold up. I think that is a “risk” that is rather small, and I would like to see Theo and the FO make the trade. I hope A-Gonz works well for you. We (I am a regular on Brownie Points, many of whom hold this view) wish that we had picked up A-Gonz’ option, since it was not much different than what we signed Scutaro for (and as much as we like Scutaro, A-Gonz is younger). So we wished the FO had signed Gonzalez, but not that we are unhappy about Scutaro. First of all, I am flattered that a student in theology actually reads my blog. Didn’t see that coming when I wrote this. In no way was this meant to be academic. I didn’t even proof read it. lol. I did have fun writing it however. I’ll leave the rest of the details to some student college student’s 3-year thesis. I think this took me 2 or 3 hours. The thought of Henry Chadwick the ‘Church Historian’ never actually crossed my mind until you mentioned it. I have heard of him briefly. There is some very comical irony in that, and I should have used it along with the amazing insight that you ‘blessed(lol, funny choice of words)’ my article with in the comment section. Being a student in Theology, I’m sure that you could conjure something very cool up as well related to this. The baseball Henry Chadwick is honoured in Cooperstown. He basically layed the foundation for the baseball ‘Bible,’ so to speak. He was a journalist that is credited with developing the modern box score and introducing fundamental statistics such as Batting Average and ERA. The man also did a lot to help popularize the game in those years. The man’s influence on the game was huge! I’m glad we are agreeing on those Blue Jay/Red Sox related matters. The extension deal demand might definately put a kybosh and any Halladay trade, I agree! When did that become a necessary condition in a trade? I want to know? I don’t hold to much weight to that, I believe a deal could probably be done without it. I agree with the Front Office that Bucholtz prospects are promising, but what is 10 times more promising, is the prospects of getting Roy Halladay! Going on the year Scutaro had last year, bar none you guys got the ‘best SS available.’ I wonder if he can keep that up though, as I’ve said. I’m sorry, I signed off thinking your name was Roy, because of the “welikeroy” squared that you use. My bad, but FUNNY! Actually, my name’s Greg, hence, the “greg1969”. And yes, I am a trained pastor. By the way, about last Feb. or March, I had posted a question to you, as I had posted to several others who are your fellow Canadians, about the viability (or not) of baseball in Canada, outside of Toronto. You may or may not remember the conversation, but I remembered it, so I popped by when I noticed your URL again. Anyhow, I’ll revisit again, at least until the season starts! Take care. I do remember your question. As I recall, the response I gave was not a favorable one. I said maybe Montreal with a downtown stadium, but pretty much the only hotbed for baseball is the Toronto area. If you can even call it that!! Countless times I’ve been disappointed by the Toronto baseball fan, and we simply don’t support baseball enough at amateur levels here. British Colombia invests more into amateur baseball, but I don’t think that they would have a viable market for a pro team. I’ll be interested to see Casey Kelly in the what I call the ‘Bible’ of scouting books, Baseball America, coming in February. He was a real ‘late bloomer’ this year in single-A, so I wonder how he is ranked in the organization now? Still a very young kid that has a long minor-league career ahead of him, for sure. Right now, I’d say the Jays are a great need in acquiring outfield prospects. We are very thin in that area. Plus, looking at the way Wells was last year, and Travis Snider’s rocky start, I would put many current AAA outfields ahead of the Jays. We need organizational depth in that area. Thanks for coming by Greg. Till next time. Take care. Yogi Berra and Winston Churchill? I really like that one! Great post and GREAT observations on baseball! Thanks Julia! You are the best. Berra and Churchill is a funny one because they both came from around the same era. I thought of two burly short guys that had some good quotes. I love the comparisons and in a way its all very true! 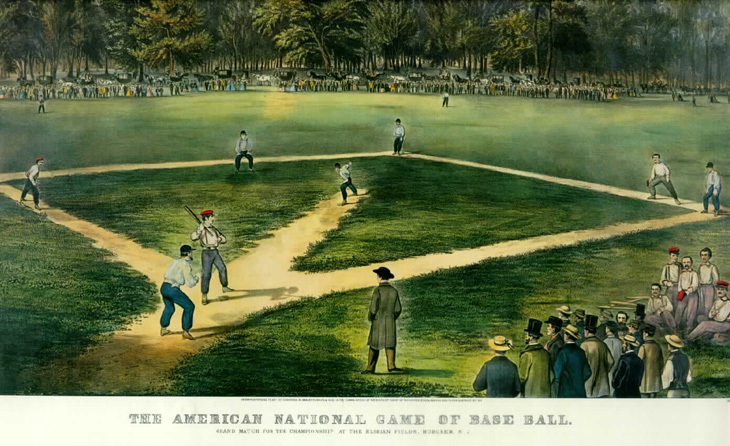 I love baseball and how it goes hand in hand with American History as well. Its been here through the joy and struggles. Wonderful blog post! I usually reckoned by means of Overbay’s superior .OBP that he or she will be batting Subsequent and never Incline. Hl seems to have established a fine #3 needless expenses, staying each of our well organized batter a year ago. And you fully understand Cito’s stance concerning pairing having obtain. Your puppy doesn’t really undertake it at all. For foreigners and Europeans in most times baseball seems to be meaningless. Al thought I respect this game. But I do not understand why the whole world is calling it football but only in America is known as Soccer. I love baseball its a fun sport playing together.